Batman takes on Jack the Ripper in this exclusive clip from Batman: Gotham by Gaslight, provided to ComicBook.com by Warner Bros. Home Entertainment ahead of the film's DVD and Blu-ray release on Tuesday. The film is the latest feature-length animated DC Universe movie to come from Warner Bros. Animation and DC legend Bruce Timm. In the context of the film, this is Batman's first one-on-one with Jack, taking place as Jack tries to kill Selina Kyle. Diving in from above, the Dark Knight saves the girl, but fails to stop Jack from making his escape. 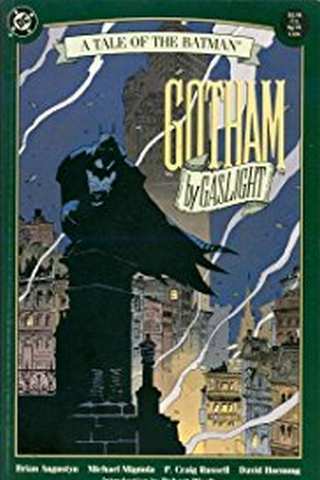 Inspired by the one-shot by Brian Augustyn and Mike Mignola, Batman: Gotham By Gaslight takes place at the turn of the century as America’s continued industrial revolution is to be showcased at a World’s Fair hosted by Gotham City. But while the world prepares to witness the glittery glory of Gotham’s technological advances, there is a killer loose in the city’s darkest shadows. Preying on the city’s women, this killer is as precise as he is cruel. As Police Commissioner James Gordon tries to calm the fears of Gotham’s citizens regarding the butcher called Jack the Ripper, the masked vigilante Batman indulges in his own detective work — with the help of confident, capable Selina Kyle — to stop the Ripper’s murderous spree. Unlike the comic, Batman: Gotham By Gaslight features a number of characters from the Batman family and the rest of Gotham City, including Harvey Bullock, Selina, Poison Ivy, and a trio of street urchins with very familiar names. This is a staple of most of DC's Elseworlds stories, but since Gotham By Gaslight was the first such story, those conventions were not yet in place at the time of its writing. Batman: Gotham by Gaslight is directed by Sam Liu and stars Bruce Greenwood as Bruce Wayne. Jennifer Carpenter co-stars in the film, lending her voice as Selina Kyle. The movie, based on DC's first Elseworlds graphic novel, will be available on-demand on January 23, 2018, and on Blu-Ray February 6. Currently, you can pre-order the title for 32% off.